Stoneangels: You can’t use nails as a dating tool, can you? Kreilick: That’s right for a variety of reasons. Stoneangels: My father used to sell antique furniture he built using a bucket of actual antique cut nails he found somewhere…! Kreilick: Case in point! The Manassas house was to be restored to a certain time period, but analysis of the nails and the surrounding building fabric showed no battle damage. Despite the age of the nails, it appeared that the house had been moved onto this foundation on the battlefield sometime after the war. So if that house was not there during the Civil War, then why bother restoring it? Stoneangels: What’s the most interesting thing you’ve seen in a cemetery? Kreilick: The most disheartening thing is previous restoration efforts that cause irreversible damage. We’ve seen some wicked horror stories that were done with good intentions – you know, cementing or epoxying things back together again, with epoxy dripping down the sides of the stone. The first rule of conservation should be ‘Do no harm.’ If you cannot restore the statue or monument exactly as it had once been, you should instead preserve the existing condition so it gets no worse. If an inscription is worn down, have it transcribed onto a bronze plaque to be installed nearby. The guideline in conservation these days is to never re-inscribe a weathered inscription. My life is dedicated to not losing original material. Never re-carve the inscription, as this destroys more of the original material. Stoneangels: Ok, I was going to say it’s ironic that you’ve currently got the contract at Laurel Hill Cemetery (Philadelphia) to restore the “Old Mortality” gatehouse centerpiece. Old Mortality, the character, went around re-inscribing tombstones – I thought that’s what you did. Kreilick: Old Mortality is a fictional figure in Sir Walter Scott’s novel of the same name. He was a stone carver who traveled across Scotland on his pony re-inscribing the names of the Presbyterian martyrs – what we just said we wouldn’t do now. Old Mortality is a large project that will take at least a year to complete. James Thom created the sculptural group in the 1830s out of brownstone taken from his New Jersey quarry. It was brought to Laurel Hill to be the symbol of the cemetery. 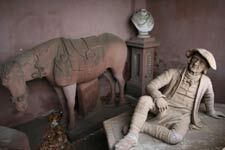 We need to first stabilize and restore the building that shelters the [life-sized] statues–Sir Walter Scott leaning in a tombstone, who is talking with Old Mortality resting on a coffin, with his grazing pony behind him, and there’s also a plaster bust of James Thom. First we need to mitigate the deleterious effects of weather on the structure itself–create a better drainage system, replace the lead-coated copper roof, re-stucco the exterior–then remove the statues and restore them individually. Stoneangels: And you do all this work yourself? Are you an artist? Kreilick: Not all. I may subcontract work out to a sculptor, a welder, or a mason. That’s the way I run my business, especially for the large projects. I establish a team to accomplish what needs to be accomplished; I would be the prime contractor. Sometimes I’m subcontracted by a structural engineer or an architect, and sometimes the other way around. Currently, my favorite projects are the smaller ones where I do the work myself. Examples are conservation of some Wright Brothers artifacts owned by the Franklin Institute. I’m working on the original model airfoils that the Wright Brothers fabricated and tested in their wind tunnel that they created, as they were discovering what the shape of the wings should be on the original Wright Flyer. There’s a couple dozen first-generation models made from saw blades and other pieces of scrap metal that they had around the bicycle shop. From these, they picked the one that gave them the best lift and drag and that’s the one they used in their original airplane. I’m working on the original lift and drag balances that they created. The Franklin Institute was one of the first organizations to recognize the achievement of the Wright Bros. This work is all funded by a Save America’s Treasures grant. These are grants that Hillary Rodham Clinton, as First Lady, helped create. Stoneangels: I thought the Wright Brothers’ planes and things were at the Smithsonian? Kreilick: The story goes that the reason these artifacts are located at the Franklin Institute in Philadelphia and not the Smithsonian is because one of the directors for the Smithsonian was a direct competitor of the Wright Brothers and so the Smithsonian did not recognize their achievement. This person was designing his own airplane and wanted to be recognized as the inventor of the airplane. Stoneangels: You can only ignore airplanes for so long. Kreilick: The Franklin Institute was the first scientific organization to recognize their achievement. So, when Orville Wright died he willed his collection of artifacts to The Franklin Institute rather than the Smithsonian.